The Ottawa 67's move onto the third round of the OHL playoffs after a thrilling yet exhausting six periods of hockey. 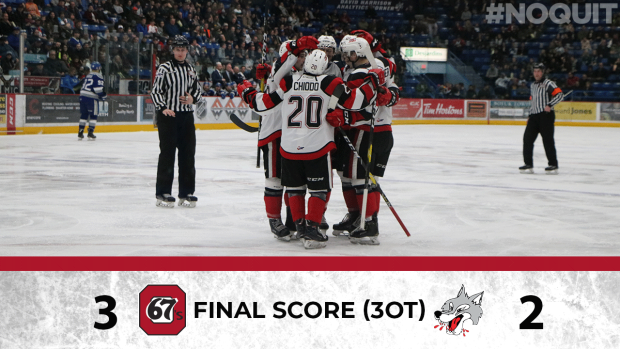 The 67's beat the Sudbury Wolves 3-2 to sweep the series 4-0. It was all about the battle of the goalies, considered to be two of the best in the league. The 67's Mikey DiPietro saving 58 of 60 goals while Sudbury's Ukko-Pekka Luukkonen faced 62 shots fired on him. Tye Felhaber scored the winning goal in triple overtime, his sixth of the playoffs. So far, the Barber Poles have not lost a game in the playoffs. They face the other eastern semi-final winner, either the Niagara Ice Dogs or Oshawa Generals. "It feels really good. They played really hard and it was a tough game on both sides, so I'm happy we don't have to extend this series. I think we played really well defensively, we didn't give a lot. (Mikey DiPietro) made it look easy and their goalie was really good. We found a way." "That was such a battle for both teams...it’s my bedtime so I thought we’d end it. That’s the biggest goal of my career for sure. They’re a great team with a bright future and it was a hard fought series. Whenever the game goes to six periods it’s anybody’s game. That was probably my favourite game to play in this whole season. We'll enjoy it – 24 hour rule – and then get ready for Round 3."